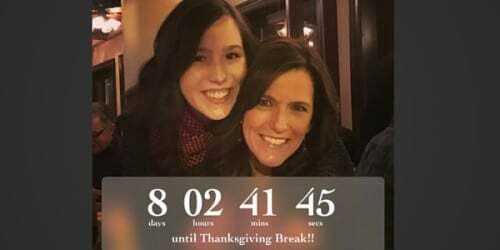 Thanksgiving break: two words that make most parents sit up and look alert for the first time in months. A long weekend (or if you’re lucky, a full week) for your heart to once again feel whole. A moment—or twenty—to grab your baby girl or boy and give them the never-ending hug you’ve been feeling and planning in your mind since you dropped them off, all those giant red X-ed calendar squares ago. You see, this isn’t my first time to this rodeo. My daughter is a sophomore. I’ve lived the whole “cram as much as you can into the time you are given” mentality of her breaks now for over a year. And while it doesn’t get easier, there is something I’ve learned. And with my daughter’s break a mere days away, I’m in full-on panic mode—and by “panic” I mean out-of-my-mind excited. I’ve been making lists for weeks. I have lists of things I need to do before she arrives (get out find the Christmas decorations; wash the sheets on her bed that my snoring husband has been kicked to most nights since she left; put all the clothes her sister has worn without her knowledge back in her closet), lists of her favorite snacks to buy (who cares if strawberries cost the same as a side of beef? ), and lists with menus for meals I know I won’t have time to make, which I don’t really care about anyway. Because, you see, there’s a list I’ve made that is far more important than the others. A list of the things I plan to do with my daughter while she’s home. A list of things that will begin as soon as she steps off that bus. • Decorate the Christmas tree. • Take the Christmas card picture. • Try not to yell when taking the Christmas card picture. • Go to dinner at her favorite restaurant. • Make her favorite meal. • Buy her socks. She always needs socks. • Offer her more food. • Spend a lazy morning at home drinking coffee and catching up. • Try not to freak her out by staring at her. • Ditto for smelling her. • Go to Target and wander the holiday aisles with a bag of popcorn. • Stay up late bingeing on Gilmore Girls. • Watch her pet her cat. • Listen to her laugh with her sister. • Remember to share her with her sister. • And her high school friends. • Hold every hug an extra second … or ten. But other than the shopping, the constant eating, and the hours of staring, there’s another, unwritten item on my list that goes along with all the others: Be present. While it’s true we’ve spent the past 12 weeks texting, talking, and FaceTiming on a regular basis, having her in front of me—in the flesh—isn’t something I’ll take for granted, and is something I will remember to soak in and appreciate, regardless of where we are or what we’re doing. Because suddenly I will blink and the long weekend will be over. She’ll be getting back on that bus and I’ll once again be in Countdown Mode—which is the title I’ve given our new normal around here. So go to Target, bake some cookies, watch a favorite movie, or simply breathe in your child’s aura while they’re home on break; do whatever you need to do to truly enjoy the few days of real, pre-Apple face time you have together before you’re relegated back to screens. And don’t worry, if you get up in the middle of the night to stare at your sleeping child just like you used to do when he or she was an infant, I won’t tell. Michelle Newman is a reformed stay-at-home mom of two teenage girls and lives in Minnesota, where she spends four months a year in hibernation and denial. Her work has been included in the New York Times bestseller “I Just Want To Pee Alone” as well as other humor anthologies and websites. 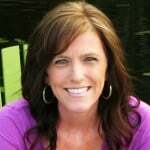 She writes about her favorite television shows as a Community Contributor at EW.com, and about life and other distractions at youremyfavoritetoday.com. Follow along on Facebook.